Thorn has been manufacturing luminaires for 90 years and they are one of the reliable, go-to companies whenever you think of streetlighting. There are several residential lanterns from Thorn but I’ve chosen the Flow because it looks different from many of the others. 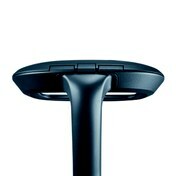 The name Flow refers to both its shape but also the way people and traffic move through urban areas. 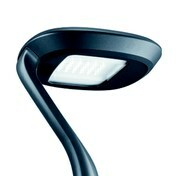 It is available with a warm 2700K light source with a colour rendering index (CRI) of >80 which makes it an ideal choice for residential areas and urban centres. Other colour temperature options are 3000 and 4000K. 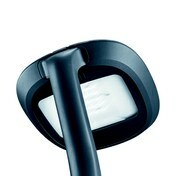 There’s a choice of 14 optical distributions and the light output ranges from 1,700 to 13,600 lumens. It’s designed to be compatible with all radio frequency systems on the market and there are other options such as Dali, bi-power, power-line and their Zumtobel Group Services’ own lighting control system, InCity.